Applications: Buick, Olds, Pontiac with 8.2'' ring gear. Non ''C'' lock axle-27 tooth pinion spline. Will not fit ''O'' axle with 12-bolt cover and 10-bolt ring gear. Techical Notes: Stock bearings are usually LM603049/LM603012 for the ring gear side and LM501349/LM501314 for the opposite side. Some use LM501349/LM501314 for both sides. 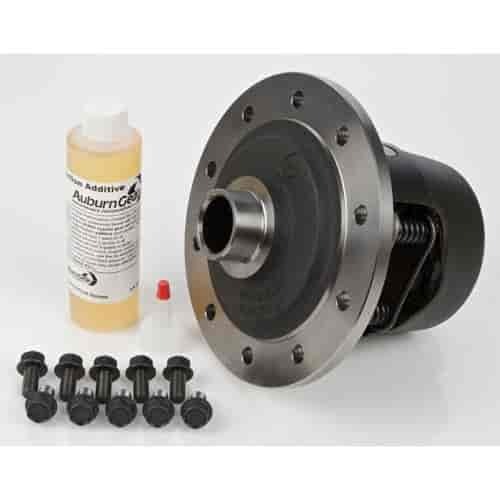 The Auburn limited-slip differential will fit in either application. They supply 2 sets of LM102949/LM102911. Axles that have the LM603049/LM603012 bearing will still use that bearing, but the opposite side will require the LM102949/LM102911 that is included with the differential. The Auburn Gear high-bias torque Pro Series limited-slip differential outperforms virtually every standard OEM differential. Pro Series differentials deliver usable traction and faster engagement for controlled power transfer and lightning-fast reaction. Pro Series differentials provide superior performance through a unique cone-clutch design that transfers more power to the high-traction wheel for quick acceleration and tight cornering. The Auburn Gear limited-slip differential employs an integral cone clutch side gear unit that creates friction with the carrier to drive both tires. The highly efficient torque transfer capability of the Auburn Gear limited-slip differential is achieved through the use of cone clutches coupled to beveled side gears. As torque is transmitted through the differential side gears to the axle shafts, the side gear separating forces and spring pre-load firmly seat the cones into the differential case. The cone design, along with the applied force, determines the torque transfer capability of the differential. When torque levels decrease, as in a cornering maneuver, the gear separating forces also decrease, allowing the axle shafts to rotate independently. This unequally divides the torque between the two wheels, delivering more torque (bias torque) to the wheel with the most traction. Does Auburn Gear 542060 fit your vehicle?